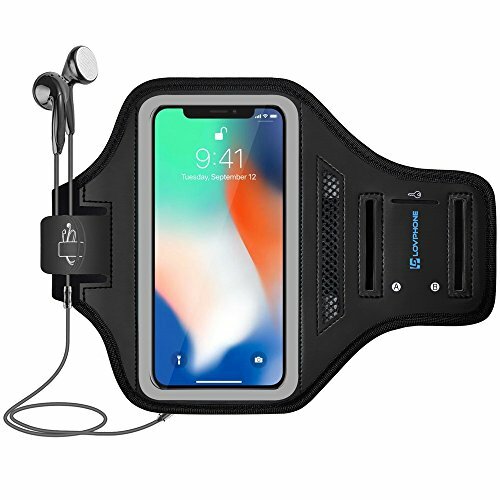 •This is the most secure armband on the market, designed to hold your phone so you don\'t even notice you have it with you. The lightweight material creates a snug No Bounce extra secure fit!! Designed specifically to easily connect headphones and provide full access to all phone ports and sensitivity, installed in seconds,designed to twist and bend but will not lose the original shape. • SECURE Built-in hidden key holder and card slot .Never worry about having to carry your keys and cards in your pocket or losing them at the gym or outside. • Water-resistant neoprene and PVC screen protector protects your smartphone from scratches,dirt and sweat. • Reflective strip circled around the screen window,keeps you noticeable while running in low light scenario.